If you are using a Chrome browser, then installing SoundCloud downloader Chrome extension will help you download any SoundCloud audio of your choice. Well, that’s if you are frequent downloader of SoundCloud soundtracks. If you are not a Chrome user, not to worry; you can follow this comprehensive guide on how to download SoundCloud audio file online. That doesn’t require you install Chrome browser before you can download the audio file. But this post specifically targets Chrome users who need a SoundCloud downloader Chrome extension on their web browser. I will share here the SoundCloud downloader Chrome Extension link as well as the installation, features and usage guide. Listen closely, after the installation of this extension you may not notice that it has started working. So let me tell you a bit more about this Chrome extension before you angrily uninstall it after installation thinking that it’s not working. How does SoundCloud downloader Chrome work? Once this extension is successfully installed on your Chrome browser, it will require no action on your part for it to start executing its task. Though this extension is dated far back 2015 from the date of this publication, it still works very fine. The main task of this extension is to download SoundCloud audio files so you shouldn’t expect anything more. All it does is to add the missing download button to any SoundCloud track of your choice so you can easily hit on it and have the file downloaded. The most interesting thing about this awesome extension is that it is absolutely FREE to use and it’s pretty easy to use. Finally, you can have all your favorite sounds downloaded into your device. Once you have the data then you are good to go. When you find your favorite track maybe through a Google search or SoundCloud search, all you need do is to tap on the download button. If you don’t have the download button, then you may not have installed the extension correctly. Reinstall the extension and I assure you to have the download button just as you have seen in the image above. Now that you know about these amazing functionalities of SoundCloud downloader Chrome extension. You can’t wait to have it installed on your browser, right? There are 2 ways to getting this Chrome extension installed on your browser. Either way works quite well. You may decide to do a search on Chrome web store or follow the direct link to the extension that will be shared here. Method 1: Go to Chrome web store https://chrome.google.com/webstore/category/extensions and search for “SoundCloud Downloader Free”. Hopefully, it should be the first extension that you see in the search result page. Tap on it and add it to your Chrome browser. From the screenshot you see above, I have the extension already added to my Chrome browser, that is why you are seeing the “Added” batch in green. Method 2: Installing it directly from the link. This direct link can be obtained from Techinformat or by conducting a simple search on Google search engine. Copy that and paste in the address bar of your browser to download the extension. 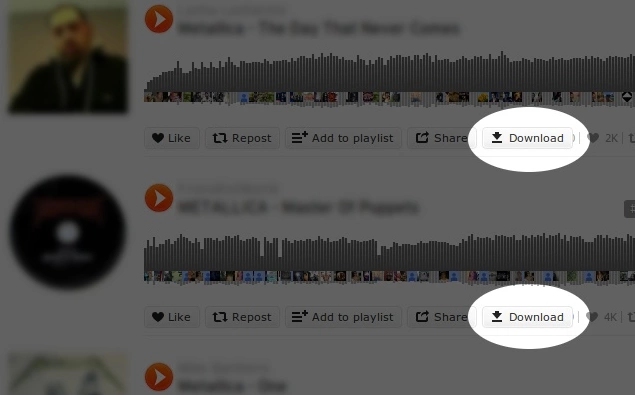 Once you install it, visit the URL of your favorite soundtrack on SoundCloud and you will find the download button aligning with other buttons on the page. Apart from this method, I shared on how to download SoundCloud audio file. Which other method do you know that can help download any audio file from SoundCloud? Could you be kind enough to share?